• High power: from 500 W to 3 kW. • Small volume 100cm3: about half-brick for 2 kW, surface 64 x 64 mm (not counting screw connectors for wires of section up to 72 mm²). • Very high efficiency: from 90 % up to more than 98 %, depending on models. 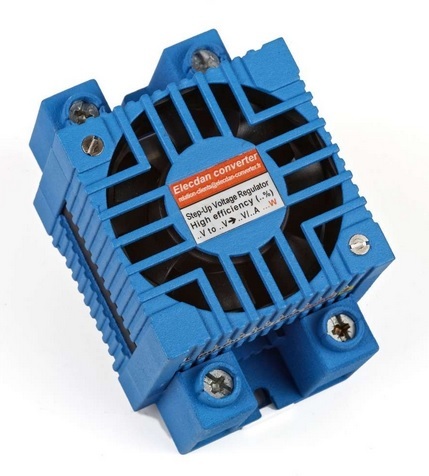 • Advantageously replaces conventional DC/DC converters whenever input/output insulation is not required. • In case of a very high starting current (motorcycle or car engine for example), our boost technique enables the switching – almost directly and immediately – from the source (battery) to the load, while a typical converter can collapse. Reinforced switch diode available upon request. • Modular design, casing ready for wall or DIN rail mounting. • Protection against humidity, dust, shocks, vibrations (IP68 or IP63 for boost converters with fans). • Made to last, high quality materials. Stainless steel for the clamping braces. • Available in 4 different shapes, depending on the cooling method. For customized step-up voltage regulators (boost regulators), please contact us. We can adjust to your specific electrical constraints, space requirements, and other needs. Our engineering and manufacturing flexibility allows us to quickly prototype and create custom step-up regulators DC-DC, generally within less than 10 days. Examples of custom voltage step-up converters and other non-isolated DC-DC converters, recently studied by Elecdan Converter upon customers’ request: some examples (see the second half of the article). The batteries you manufacture (or use) provide electrical energy … but at fluctuating voltage, sometimes slightly or highly insufficient, which makes these batteries unsuitable for many applications. Our boost converters eliminate these imperfections, and transform your batteries (of whatever technology) into generators of stable and adapted output voltage. All this with a very high efficiency (up to 98%) and within a small volume.